"You wanna sing along?" Dan Mangan asked just prior to the final song of his band's tour-opening show in Halifax last night. "It's about time!" yelled someone from the middle of the crowd. The line was seemingly meant in good fun, and both the band and the audience had a nice laugh with it. But the point was fair: If you had come to see Mangan expecting to be marshalled in familiar tunes by your favourite folksy, bearded Vancouver-based troubadour, you'd perhaps come to the wrong tour. Those in the crowd who'd spent any time at all with Mangan's new album, Club Meds, likely knew what was coming. The record being credited to both Mangan and Blacksmith isn't simply about paying proper respect to Mangan's longtime backing band; it's a signal that the shift away from his singer-songwriter sound that began on 2011's Oh Fortune has become a much sharper break. Last night's (February 18) sold out concert, the first stop on a 17-date cross-country trek (with a couple U.S. dates for good measure) was not only the band's first full live set in over a year and a half, but also its first chance to weave the new material into a proper show. The 18-song set opened, like Club Meds itself, with "Offred" and "Vessel," followed by a trio of Oh Fortune songs reworked more in the Club Meds mould, trading driving, folk-style stomp for proggy groove. As if to drill the point home, Mangan's guitar was mixed low for much of the night (perhaps too low as, at times, he could be seen asking for more volume from the sound tech). This made the acoustic guitar — traditionally, the core of Mangan's sound — more of a rhythmic element, increasing the focus on the twisting, arpeggio-heavy interplay between lead guitar, bass and drums. Not unlike my reaction to Club Meds itself, I had mixed feelings about this. Part of me feels that in the band's noble desire to move in a different direction, some of Mangan's greatest strengths as a performer — his ear for hooky melodies; his boisterous, infectious enthusiasm — are being neglected. More importantly, I found myself questioning whether what they're being replaced with measures up: while the Club Meds material provides an intriguing sonic mood, it's considerably less memorable on a song-by-song basis, and its focus on slow-building crescendos means the songs stay tightly wound, failing to deliver much in terms of cathartic release. Yet, despite this, it was hard not to be won over by last night's show. For one, those crescendos are still impressive on their own terms: at various points in the night guitarist Gordon Grdina and trumpeter JP Carter, together, built dizzying walls of noise out of distortion and delay, offering a woozy sonic canvas in near-perfect sync with the hazy, spiralling lights shining from the back of the stage. But, just as importantly, Mangan's booming, raspy voice — arguably his greatest strength —remains as powerful as ever, bellowing its way through classics like "You Silly Git" with the same force as it tackled new material like "Kitsch" and "Forgetery." 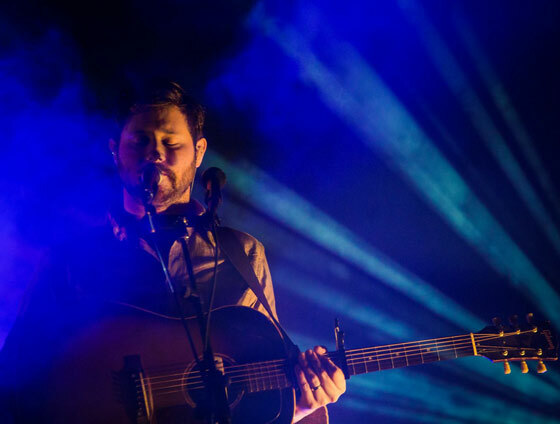 In many respects, his voice is the connecting tissue between "Dan Mangan" and "Dan Mangan + Blacksmith." And sure, it was the "Dan Mangan" material that the crowd responded best to, but that's to be expected. "Road Regrets" remains something special, and somehow untainted by the prominence of a million Mumford and Sons sound-alikes trying to do the same thing. Mangan's solo acoustic performance of "Basket," which kicked off the encore, had the crowd swooning, and the band's slowed-down take on "Sold" (the aforementioned show-ending sing-along) owed more than a bit to the Pixies' "Where Is My Mind?" If the show felt somewhat split at times between the sonically interesting Club Meds material and Mangan's emotionally compelling back catalogue, so be it: It only suggests that, should Mangan figure out how to succeed on both fronts at the same time, he may become downright unstoppable as a performer. If Mangan was taking his audience into somewhat unfamiliar territory, Hayden's opening performance was decidedly comfort-zone material — in a good way. Following a short-but-sweet solo set by Astral Swans, performing songs his new album All My Favourite Singers Are Willie Nelson, Hayden took to the stage wearing the most Hayden-y sweater imaginable: knitted grey, with horses and horseshoes in a pattern. His set felt equally well-fitted: "Almost Everything," with its namedrop of Halifax, played wistfully nostalgic, and the pairing of Saturday songs "Home by Saturday" and "Rainy Saturday" was sweet and soulful even on a Wednesday night. Though concentrated tightly together at the centre of the stage, Hayden's band sounded as large as could be, winding up its nine-song set with a version "Dynamite Walls" that built into an explosive fury by its final, pounding chords.